[box style=”red”]REBOOT is an occasional series of posts on GC:PVD where we identify areas of the city that display poor urbanism and propose ways to improve them. 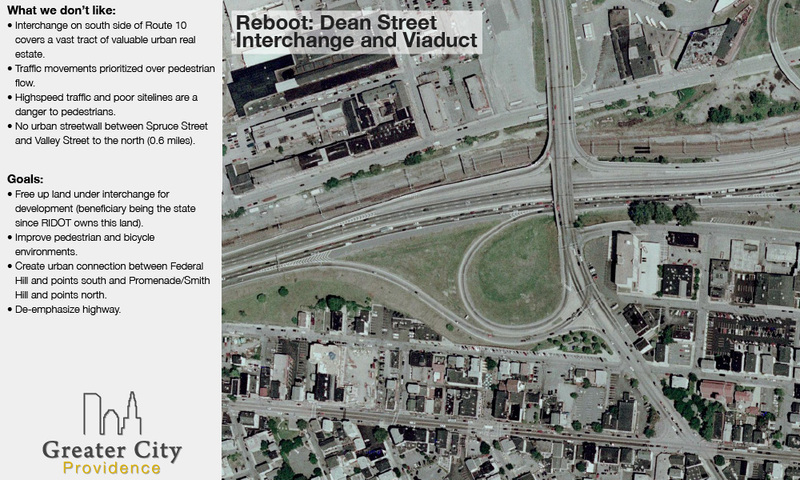 Our first reboot is the Dean Street Interchange and Viaduct between Federal Hill and the Valley/Smith Hill neighborhoods. Currently there’s no doubt, this area is built for the automobile. Lanes are wide, turning radii are designed for highspeed auto travel, sightlines for pedestrians are limited, and in many areas sidewalks and crosswalks are non-existent. There is also no proper streetscape. In the Federal Hill side the street is lined with highway ramps and surface parking, with small buildings set back from the street. On the Valley side the street is lined with industrial areas with open surface lots below the raised berm the street sits on. To the north of that, across the river lie suburban style development, gas stations, car washes, drive-thru fast food joints and more surface parking. We propose a radical intervention to make this area more urban, improving pedestrian and bicycle connections between Federal Hill to the south and Valley and Smith Hill to the north, de-emphasize the highway, create urban streetwalls with buildings, stores, and parkland, and free up acres of land for redevelopment. Above you can see the radical transformation of this area. The most striking transformation being the removal of the wide arc of highway ramps freeing land tot he north of Spruce Street for redevelopment. The state would be the beneficiaries of this redevelopment as RIDOT currently owns the land under the ramps. Conceivably, sales of the land could be used to pay off bonds used to pay for the highway improvements. The traffic movements that the ramps provided do not go away, in fact traffic movements that currently do not exist would be added. Traffic from Dean Street to Route 6 east and west would now originate from one intersection north of the highway. 6 west traffic would use the existing ramp, 6 east (and 95 and 195) traffic would use a new slingshot ramp which branches off the existing ramp. The slingshot would be the most expensive part of this intervention, and not being a traffic engineer, I have not done the proper surveys to ensure that it would fit in the footprint I’ve proposed, but with a little wiggle here and there, it should fit. Currently, traffic northbound on Dean Street cannot reach either of the existing ramps to Route 6, without turning around using Promenade, Acorn, and Kinsley. Northbound Dean Street traffic would now be allowed to turn left directly onto the ramps to Route 6. Also, the current ramp to Route 6 west now branches off Dean Street at an angle (highway-like). This creates a large gap of highspeed traffic for pedestrians to cross. There is also a metal panel to protect people from the Amtrak catenary lines that blocks pedestrians’ ability to see this highspeed traffic. From personal experience I can attest, crossing the ramp entrance here is in effect, a live action version of Frogger. Traffic that currently comes from Route 95 northbound bound for Providence Place now arrives on a ramp and stays in a separate lane parallel to Dean Street to where it finally merges with Kinsley Avenue (aka Providence Place). This ramp would now instead end at Dean Street itself with a right angle traffic-light controlled intersection directly across from the ramps to 6 east/west. Alternately, this ramp could be eliminated altogether and instead rise up over the train tracks to meet the ramp from 95 southbound that currently reaches Kinsley Avenue just before the903. However this would entail more expensive engineering and bridge building in addition to the slingshot. Currently, there is no sidewalk on the east side of the Dean Street Viaduct, this ramp from Route 95 northbound is part of the reason why. Forcing traffic to Dean Street at a traffic light makes the traffic stop allowing it to transition from highway speeds to city speeds, and allows for pedestrian movement at the light. 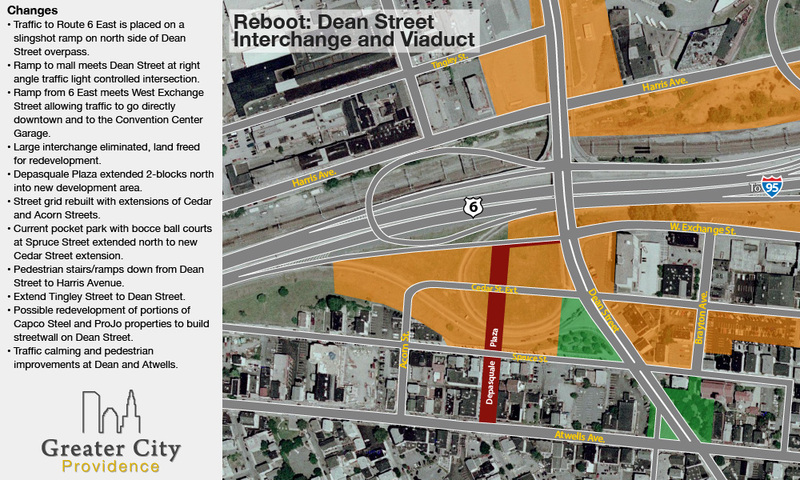 The ramp from Route 6 eastbound to Dean Street would be moved to align directly with West Exchange Street. This alignment would allow the ramp and West Exchange to be controlled by one traffic light and have one area for pedestrians to cross. Lining up this ramp with West Exchange also allows traffic from 6/10 to move straight toward Downcity and the Convention Center Garages without having to go onto Dean and Atwells. Now that the ramps have been removed, we see there is a large area open for redevelopment. Cedar Street and Acorn Street can be extended into this development area and you can see that entire city blocks are created by the relocation of the ramps. Depasquale Plaza can be extended northward two blocks with more shops and restaurants lining it. Closer to the highway taller buildings should contain residences and offices, perhaps a hotel. Toward Spruce and Dean Streets buildings would drop down to lower heights more in line with the rest of the neighborhoods. Extending Acorn Street north would mean the demolition of a wing of the building currently housing Casserta’s. Obviously it should go without saying, this whole plan stops dead in it’s tracks until we find a new home for Casserta’s. Being that much of the ramp structure currently sits below the grade of Spruce Street, the lower areas could conceivable be filled with structured parking to bring the building pads up to street level. Providing much needed relief to the parking demands on Federal Hill. Where Dean meets Atwells we currently see a continuation of this highway-like structure to the roadways. This intersection should be re-engineered and re-aligned to make the intersection make sense for the vehicle traffic and be safe for pedestrians. It currently creates a large impediment to pedestrians trying to stroll Federal Hill. Other areas south of the highway are marked orange for development. The areas between West Exchange and the highway could perhaps support an interestingly designed structure. The parking lots of Cedar Street are crying out for redevelopment. The parking lot in front of the Johnson & Wales dorm has to go. I’ve also marked the whole block bounded by Brayton, Dean, Cedar, and Spruce for redevelopment, there are some buildings that should be saved on that block, but also lots of surface parking, and the whole unremarkable one-story building set back from the street that used to house Providence Medical. Dean Street currently crosses Harris Avenue on a bridge. Due to the need to cross the train tracks it would continue to do so. However a pedestrian connection from Dean down to Harris should be built. A new building between Harris and the train tracks with second floor frontage on Dean and ground floor frontage on Harris could provide the structure for this pedestrian movement. North of Harris Avenue we would ideally see some development of the Capco and ProJo sites to allow for the streetwall to be rebuilt. Currently Dean Street sits on a big mound as it transitions from the viaduct back down to ground level, with wide open spaces at Capco and ProJo on either side. Of course development on these areas would have to not negatively impact these businesses. A thin liner building between Capco and Dean Street would provide revenue for Capco and improve the area. If not detrimental to Capco’s operations, bringing Tingley Street out to Dean would be ideal as a way to further make Dean feel like a city street and less like the highway it feels like now. If buildings are not feasible, then heavy plantings should be installed. Dean Street is the only direct connection between Federal Hill and the burgeoning Promenade District. It is also the only north-south route for pedestrians and cyclists between Francis Street in the east and Eagle Street in the west. Currently, it is not a pedestrian connection, it is far too dangerous for people to walk in this area (though some brave souls still do). As built, it only serves cars, and people who drive it know, it is not even doing that well. It is vital link in our city. It deserves a high level of attention to ensure that it is functioning link. As someone who currently lives near the Atwells-Dean intersection and someone who would bike or walk Dean St. to get to Smith Hill/Elmhurst, I have to say the first thing that needs to be fixed on Dean St. is the Atwells-Dean intersection. Not only is it not pedestrian friendly (the crossing signals don’t even work), it’s dangerous for cars (the red lights have no delay, meaning the minute one turns red, the other is turning green). The size of the intersection is also ridiculous. While I can understand the need for 3 lanes of traffic coming up to Atwells, to go in one of 3 directions, there’s the equivalent of 4 lanes with the way the road is setup. It should come at a nice square right angle to Atwells. In my opinion, the rest of Dean St. is less of a priority, but this section, in an extremely walkable area with tons of people out and about on a daily basis all year is a hazard. The second part the should be dealt with is making the crossings safe by the highway entrances and around the river. The road doesn’t even need to be 2 lanes north of the river. There’s never enough traffic there to warrant that as half the cars turn towards the mall/Foundry.